Mapping the elements of a story can help students to see the big picture of what goes into making a good story, but story elements is also one of those topics that gets repeated over and over throughout the years in an English curriculum. What do you do about teaching story elements to students who have seen it several times already? It may help to think of story elements as a sequence of increasing skills, beginning with the basics and gradually becoming more complex. For example, on their first exposure to story elements, students might only identify the characters, the setting (time and place), and the main events of the plot. Next, they might also identify the problem in the story and talk about its message or theme in a simple way, such as identifying the moral in one of Aesop’s fables. Next, they might learn to name character traits, include the concept of duration as part of the setting, and complete a plot map with rising action, climax, and falling action. A further step might include more work with characterization, such as completing a character map in which the students look at what a character says, does, and thinks, and how other characters react to this character. The plot map might now include exposition and resolution. Instead of just stating the problem in a story, students might now identify both the conflict and its resolution. Work on themes now might include looking for a number of themes that are common in literature. Later, the idea of conflict could be expanded to include identifying whether a conflict is internal or external, and finding examples of various types of external conflicts in a story. Of course, your own sequence will depend on what you need to cover in your class and which skills you kids have already mastered. When the kids are having trouble mastering a new concept about stories, it may help to make it clear for them if they go back briefly and see how this new concept fits in with the story elements they are already familiar with. There are so many useful skills included in the study of story elements that students do need repeated practice to make use of what they are learning, but introducing the elements of a story gradually can help students to organize the ideas and to remember them better. 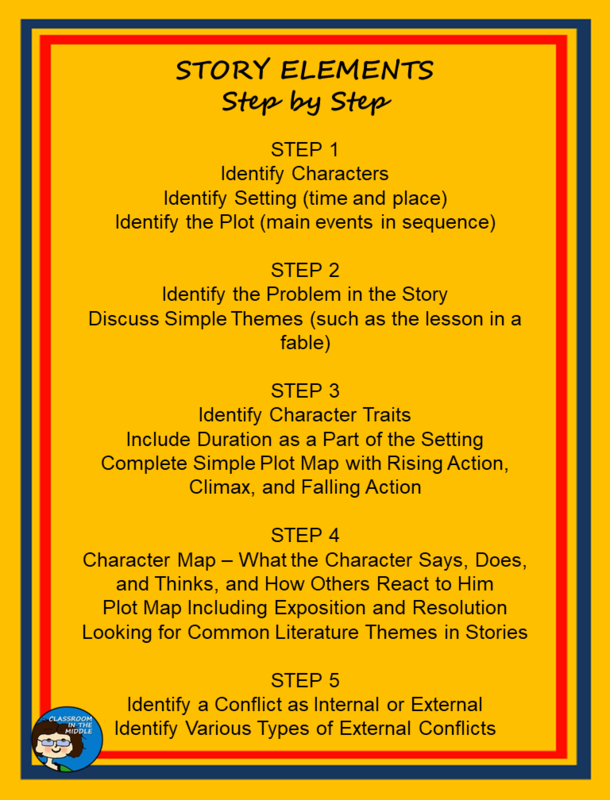 Here is a simple chart of story elements in a step by step sequence. 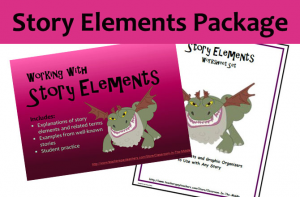 You can download a copy here: Story Elements Anchor Chart. 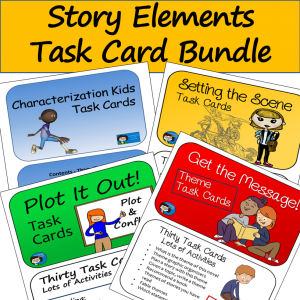 If you are looking for some useful classroom resources, here are links to my Story Elements Package and a set of story elements task cards.